IKE (Innovation and Knowledge Exchange) Assured® is an independent accreditation that is used by universities and colleges to demonstrate the value and relevance of innovation and problem-solving skills within their educational programmes. It provides a platform that educators can apply to demonstrate their students’ ability to examine a problem or challenge, collect useful information, apply problem solving strategies, build a business case, execute a plan, monitor progress, and critically review each step. Achieving the IKE Assured® Accreditation differentiates your organisation from competitors and signal to students, employers and other stakeholders that your graduates possess the innovation skills and problem-solving competencies required to succeed in today's ever changing business environment. KE Assured® focuses on how the development of innovation skills and competencies are being undertaken and their impact on the organisation. 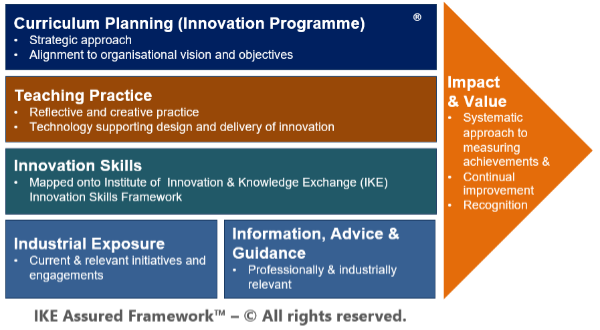 IKE Assured evaluates innovation training and development programmes using the IKE Assured Framework criteria that identifies where and how innovation skills and practices are being developed. IKE Assured® is suitable for any educational provider (colleges and universities) able to demonstrate the development of innovation and problem-solving skills and competencies in their students and graduates. Professional recognition and direct full membership entry grade (with post-nominals MIKE and FIKE). Thus, ensuring an effective and sustainable innovation skills and capability. The Panel will assess your application and generates a Recommendation Report and an Action Plan for improvement. The Report will then be submitted to the Innovation Councilfor final assessment and ratification. "Achieving the IKE Accreditation Award provided external recognition for all our employees that have been involved in the innovation programme. It enabled us to benchmark our content, processes and delivery. It also means that all successful participants on the innovation programme will be eligible for a full membership grade of the IKE Institute and will also be awarded the Certificate of Professionalism of Innovation Practice. This is brilliant news and a great honour for MBDA.